I know that you probably have lots of questions right now. SCOBYs aren’t the prettiest things, so you’re probs confused and wondering if you’re supposed to eat that thing (please, God, no), or if it’s some kind of facial mask or what. I promise, all questions will be addressed, but just hang with me. SCOBYs are not easy to photograph, and it’s extra hard to make them look appetizing enough to be featured on a food blog. 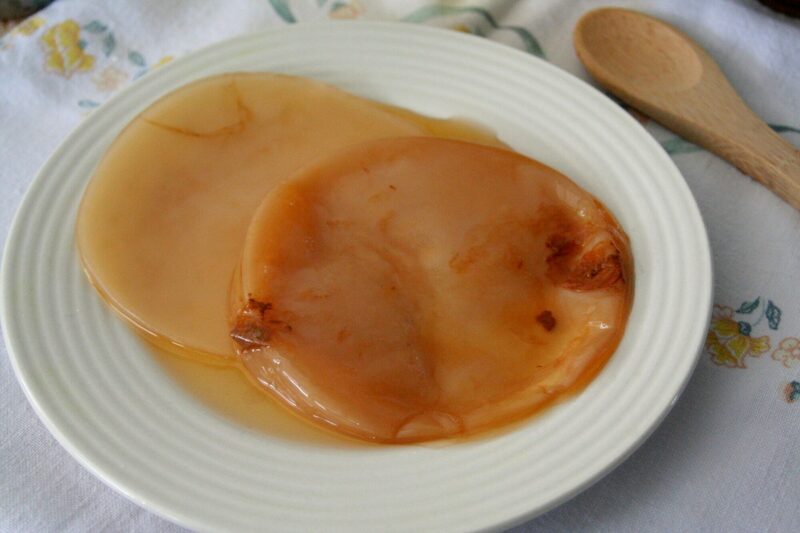 A SCOBY is an acronym for ‘symbiotic colony of bacteria and yeast’, and it’s used to make kombucha. Now what’s kombucha? It’s a naturally carbonated, sweet-and-sour drink made by fermenting tea. Like wine and coffee, kombucha takes a few times to get used to. It contains a little bit of alcohol naturally, but it’s perfectly safe for kids to drink! Mixed with fruits and juices, it’s very versatile and tons of flavor combos can be made. If you’re a big soda-fan looking to cut the sugar-y chemical-laden drink out of your life, kombucha is for you. Why? It has tons of health benefits! 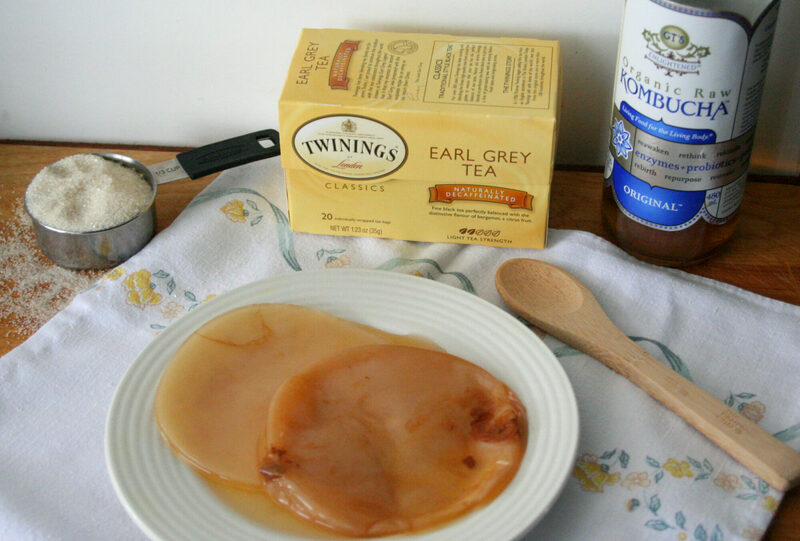 Funny story: Don’t use earl grey or decaffeinated tea to make kombucha! I just grabbed the box without thinking (because it’s pretty), but I actually used a regular, caffeinated black tea to make my SCOBY. Kombucha helps with gut and digestion health, detox, immune health, etc. However, I personally like kombucha, because it helps with stomach problems. My stomach is sensitive to all kinds of foods, and on certain days it can make me quite nauseous. Friends with similar stomach problems recommended kombucha, and I really love how it makes me feel! I don’t necessarily drink it every day, but every couple of days does the trick and really limits my ‘sick days’. The only downside to kombucha is that the cost can add up if you’re consuming it in large amounts. My solution was to learn how to make it, starting with the SCOBY! 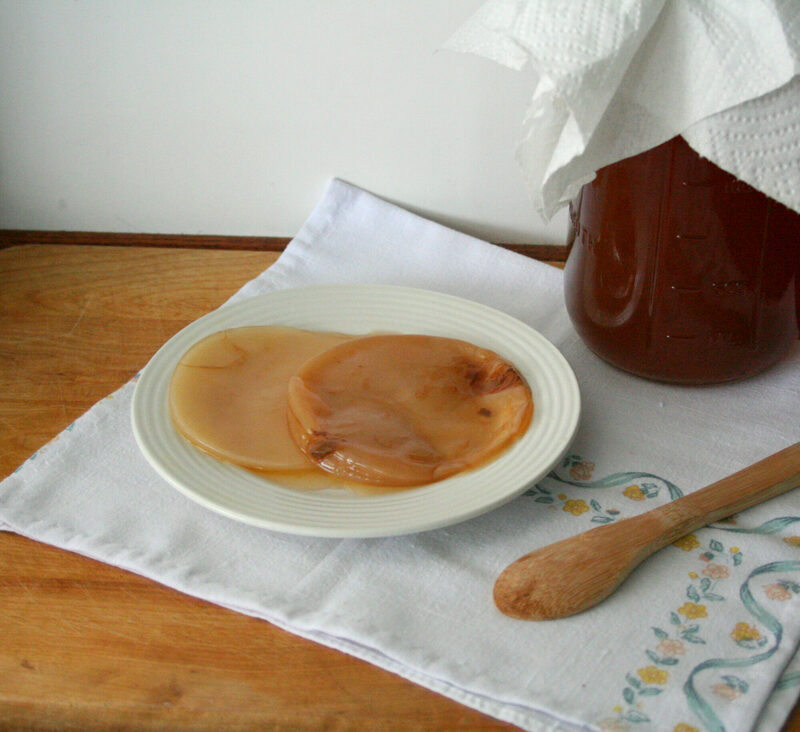 The SCOBY is necessary, because it helps ferment the tea, which also adds health benefits. You can buy SCOBYs online, but I’m incredibly impatient and don’t like waiting for things in the mail. My next option was to learn how to make one. (Bonus: buying the stuff to make a SCOBY is cheaper than buying a SCOBY online). Once you make one SCOBY, a new SCOBY will be made with every kombucha batch. You can start a farm of SCOBYs, or you can gift the new SCOBY to a kombucha-loving friend. *Disclaimer: Some people recommend not making a SCOBY, but rather buying one, the main reason being that SCOBYs do not always grow if they’re homemade (has not been a problem for me at all). However, I see no real risks in growing a SCOBY, and mine turned out successful! Choose whatever option you’re comfortable with. 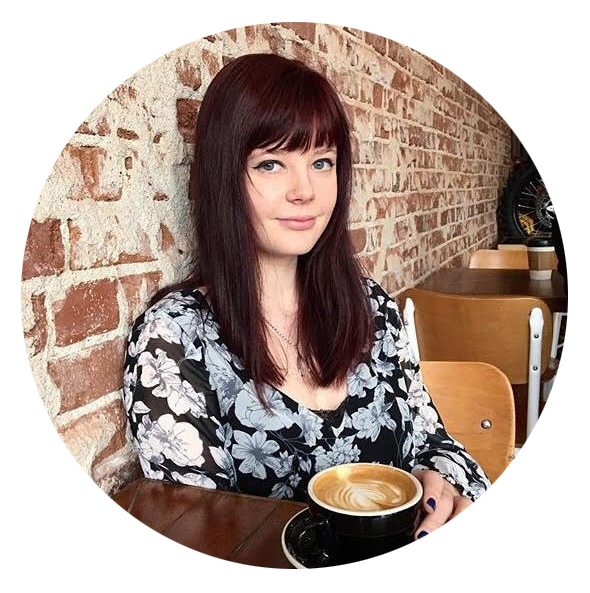 Don’t use earl grey or decaffeinated tea! Grabbing this box was a Sara-moment. I used caffeinated, regular black tea. First, you’ll start by making a sweet tea. The best tea to use is regular black tea, because it helps the SCOBY grow. Once you have your new SCOBY, you can try other teas for the next batch, but try to use black tea at first! 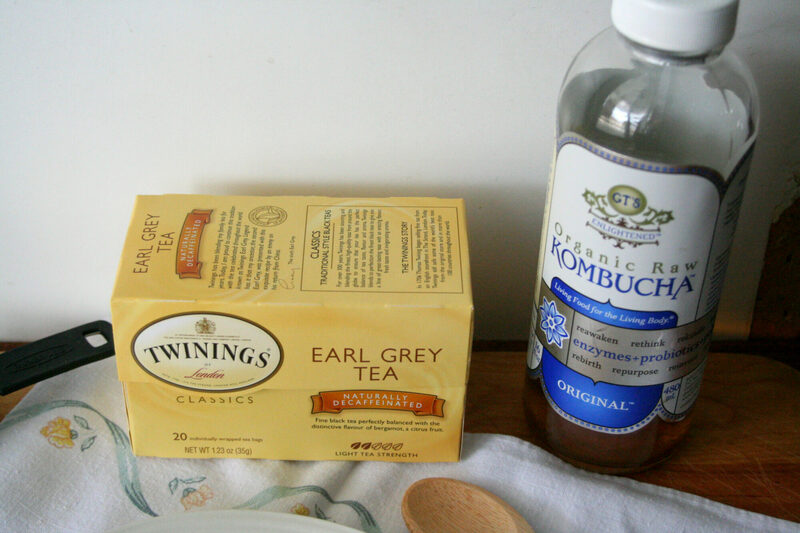 Kombucha works best with caffeinated, non-herbal teas. Herbal teas can damage the SCOBY, so be cautious. Alternatively, you can use 1 1/2 Tbs. loose-leaf, but make sure to strain the leaves out before making your SCOBY. Next, you’ll mix together your (cooled) sweet tea with a cup of your organic, raw kombucha. 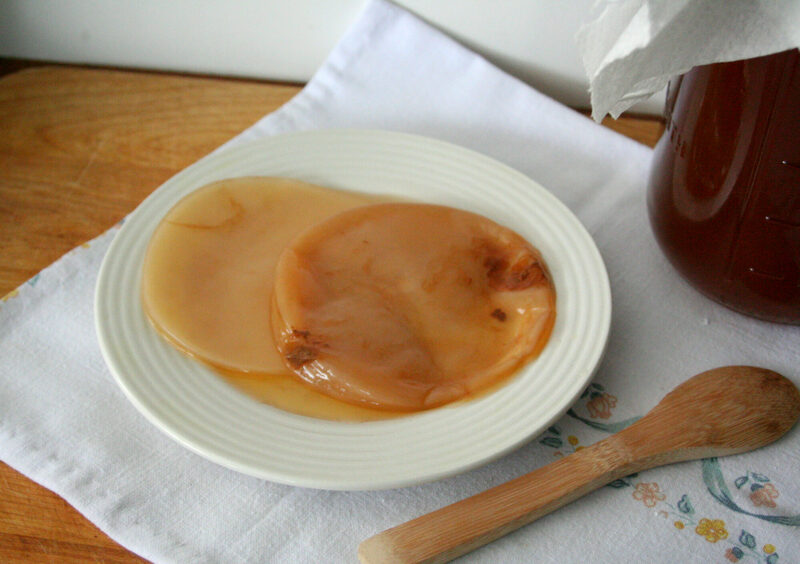 You’ll want unflavored kombucha so that your SCOBY grows. Then, you’ll put the mixture in a large jar. 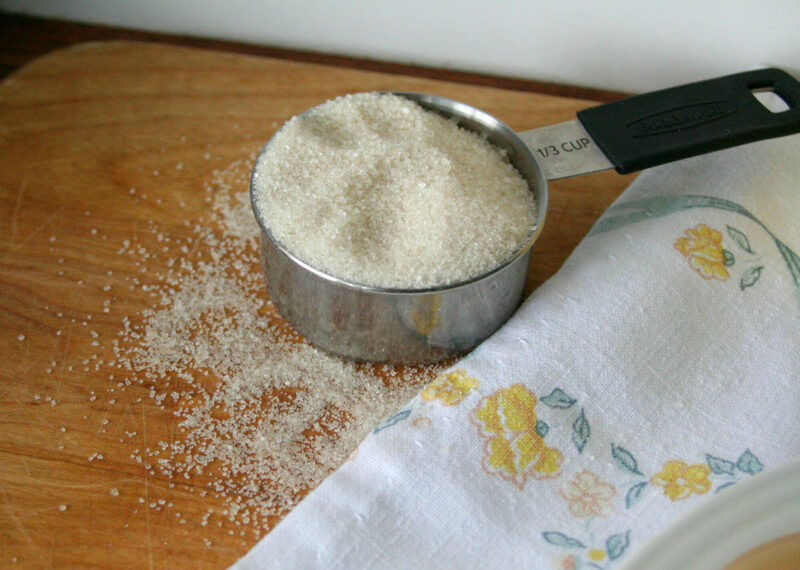 You’ll want to wrap the mouth of the jar with paper towels or coffee filters to keep out bugs. Then secure the paper towels with a rubber band, and pop on the lid! 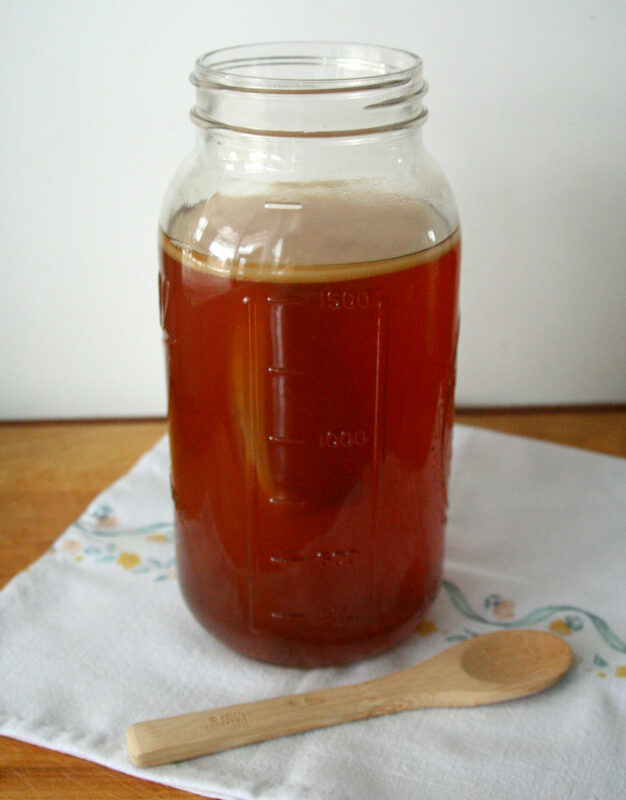 Place your SCOBY in a dark room with an average temperature (not too cold, not too hot). Leave it there for about 4 weeks. You’ll start to notice a little film forming over the top. It’ll get thicker and thicker, it may change colors, get bubbles, etc. Don’t worry. As long as it doesn’t grow grey or green mold, it should be fine. Once it’s all grown up, you can use it to make your own kombucha! The remaining liquid is drink-able, but it will be very strong. You can use some of the liquid to make your first batch of kombucha, but you’ll probably want to just discard the rest. 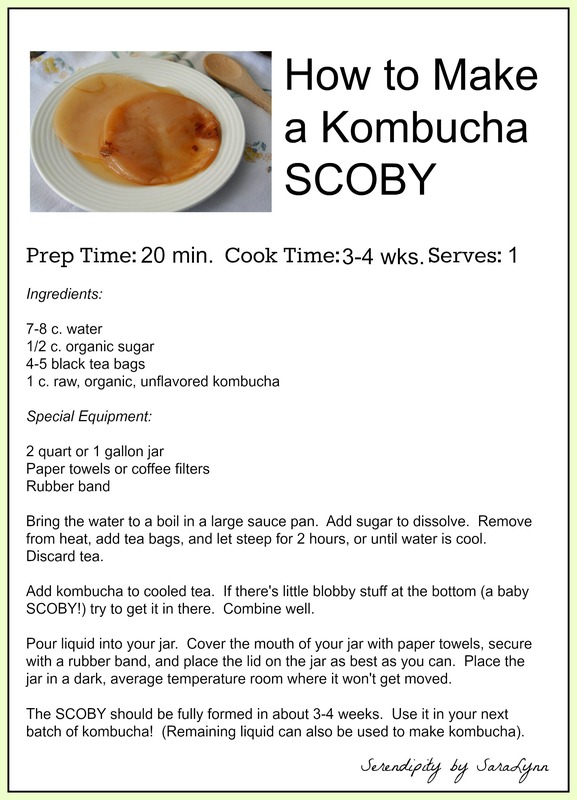 This article is very informative and helps to allow me to decide on making SCOBY. Thank you for this info and love your website. Thank you, I’m glad it’s helpful!